At 14 ALEX started playing guitar at Kingston Mines in Chicago. There he met Bluesman Charlie Love who mentored him throughout his teenage years. 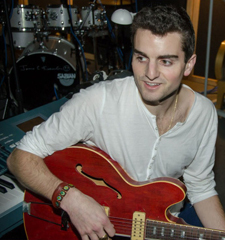 Alex’s music is deeply rooted in gospel, blues and soul. Alex went on to work with Charlie Love cruising the Carribean and the Mediterranian. Once back on land Alex was ready to make his own music. He met John Christy whose recording studio became his second home. Through John, Alex met Rico McFarland who emerged as Alex’s producer & collaborator on his new album. Alex’s deep respect for musicians who have come before him ultimately inspired him to to record songs from a classic era of R&B. His influences range from Albert King, Howlin Wolf, Lighten Hopkins, Stevie Ray Vaughan to local Chicago artists such as Walter Scott, Rico Mcfaland, Carl Weathersby, Billy Branch and Sugar Blue. Rico McFarland introduced Alex to the soul and R&B sounds of Little Milton and Tyrone Davis, as he was band director of these artists. Alex’s first CD reflects his respect and admiration for these past artists. It is Alex’s hope that, through reviving some of these songs, a whole new generation will come to know and appreciate these greats. Alex’s CD is a soulful mix of originals & cover tunes.